National University of construction and architecture was founded in 1999 on the basis of Kyiv State Technical University of Construction and Architecture. But its history begins long before this date: since the time of its foundation in 1930 on the bases of the Department of factory and communal construction of Kyiv Polytechnic Institute and architectural faculty of Kyiv Art Institute. Then it was called Kiev Construction Institute. In 1939 Construction Institute was subordinated to the Commissariat of Construction and was named Kyiv Civil Engineering Institute. In 1976 Kyiv Civil Engineering Institute was awarded with the order of Labor Red Banner for the achievements in training specialists and research activities and became known as Kyiv Civil Engineering Institute of Labor Red Banner Order. In 1993, our institution was known as Kyiv State Technical University of Construction and Architecture. 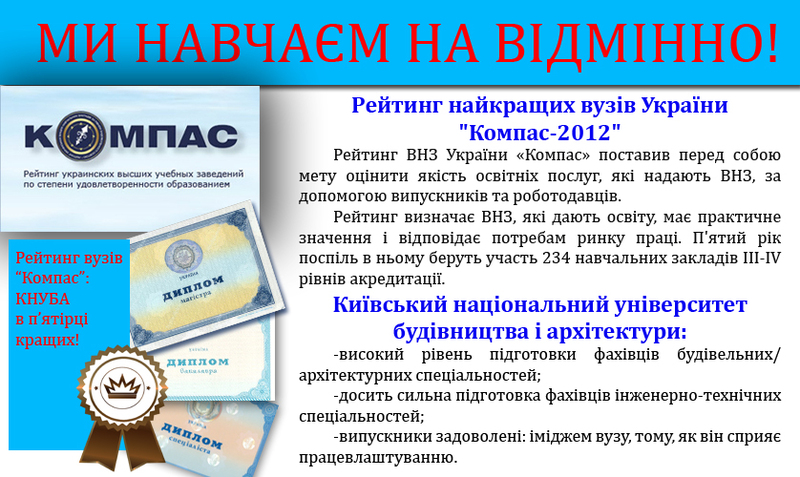 From 1931 till 2005 KNUCA trained about 64 thousand specialists, including for 80 countries of the world. At 6 faculties of the University specialists in 23 specialties and 13 directions are trained and about 8 thousand students are taught. Educational process is provided by 50 departments and their highly-qualified scientific and pedagogical staff, which has more than 630 scientists with scientific degrees and titles, among them about 90 doctors of science, professors. The University came out 2 hero of the Soviet Union, more than 70 laureates of state prizes, honored workers of science and winners of awards named T. Shevchenko, 4 heroes of Ukraine.